The police in Nigeria’s Federal Capital Territory have rearrested a man believed to be an escapee from the Koton Karfe Prison in Kogi State. The Police Commissioner in the Federal Capital Territory, Mr Wilson Inalegwu, named the man as James Dangabas. He said he had been returned to the prison authorities. The prisoners had escaped from the jail after gunmen armed with grenades and heavy fire arms attacked the prison in Nigeria’s north central region, setting over 140 inmates free. Residents of the state said that they heard gunshots and explosions at about 10:00pm local time on November 2. Reports say that security operatives made frantic attempts to repel the attack by some gunmen. About 119 of the persons in the prison were awaiting trial and one prisoner was killed while the prison guards were trying to ward-off the attack. 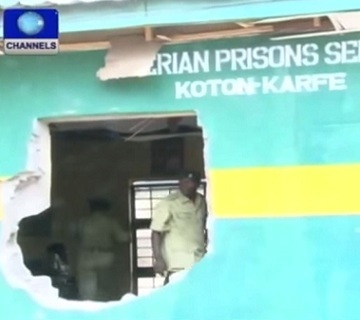 That would be the second time that gunmen attacked the Kogi prison in the last two years. Meanwhile, the police paraded several suspects for several criminal activities, including armed robbery, fraud and car theft. The police also confirmed the arrest of a 27-year-old woman, Patience Stephen, for alleged child abuse. Mr Inalegwu explained that the suspect almost killed her five year old daughter, Abigail, over allegations that the little girl allowed thieves to come into their apartment to steal her money. He added that the woman, who is the mother of the girl, had inflicted cuts all over her body using a razor and seared parts of her body with a hot metal.